Cranleigh Rotary :: Cranleigh Rotarians Are Good Sports! The 2014-15 period has seen some excellent performances by Cranleigh Rotarians taking part in District sports competitions. 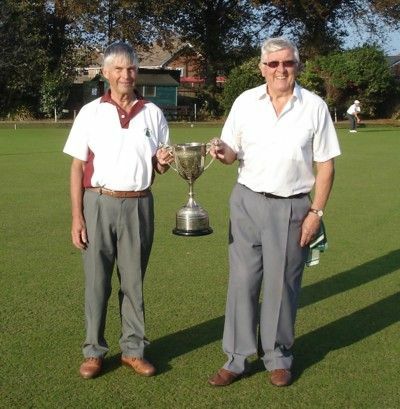 For the second year running, Cranleigh Rotarians Patrick Leake and John Greenwood have won the Bowls Cup. On 18 September 2015, they beat West Worthing A (Richard and Pamela Duffield) 20-13 in the final of the Rotary District 1145 competition. The previous year, the same pair beat strong opposition from the Rotary Club of Littlehampton to triumph in the District 1250 final (top photo). On 13 April 2015, Herb Cherry and Peter Bond won the Bridge Competition for the second time, comprehensively defeating a team from Shoreham Rotary Club. 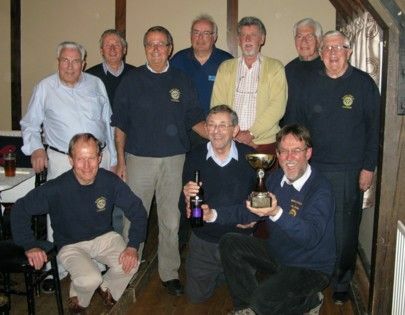 Then, on 27 April, a Cranleigh team comprising David Hall, Patrick Leake, Brian Arendell, Richard Kenyon, Tom Cornwell, David Gill, Andy Kolmar, David Barry, Brian Vine and guest Mike Ellis beat Seaford in the final of the Skittles Competition. Mike Ellis collected a bottle of wine for the highest individual score of the evening, with an impressive 23 points on what turned out to be a very tricky alley! After an excellent supper, the Cranleigh team then completed a clean sweep by winning thecharity competition, pocketing £20 for their club’s charity account. The cup was presented by Simon Edmands, the District 1250 Sports Officer (lower photo).